Why Implement Manufacturing Software for Small Businesses? This post is for manufacturers interested in learning more about PBS™ Manufacturing software for small businesses and mid-sized companies. This couldn’t be further from the truth. There are systems designed specifically for the smaller company that can help you do so much more with your business. Let’s explore these a little deeper. Though many companies feel like they have things ‘under control,’ the reality is quite the opposite. When managing the plant manually, you lack the visibility to ensure that you are getting things done in a timely fashion. There are many reasons for this though one of the big ones is not having the material you need when you need it. The bin was supposed to have 500 washers in it. These aren’t washers you can get at the local hardware store, they were specialty washers required for this particular product. Their manual system indicated that they should have 500 in stock and as such, they never ordered more. They assumed that they had what they needed. This one item was holding up a $50,000.00 order and it had been sitting for nearly a month past it’s due date awaiting them to come in. So many operations run into this same scenario. Sometimes it just holds up an order for a few days. Other times, it could result in the order sitting for months waiting for the material to come in that should’ve been ordered much sooner. This is where manufacturing software for small businesses can help. The system will provide the visibility you need to highlight material deficiencies when you still have time to do something about it. If something was overlooked, reporting will continue to flag the item until the need is satisfied. This can virtually eliminate the scenario above. The wonderful side effect of this is many companies are able to reduce product lead times through improved visibility and better planning. By keeping materials flowing as they are needed, orders can be completed faster, and more efficiently, allowing you to better meet your customer’s demand. We’ve seen customers implement manufacturing software for small businesses and reduce lead times by as much as 50%. In the process, they’ve made themselves more competitive in their respective markets. Some leverage this as a competitive advantage while others use it to leverage higher fees for rush orders resulting in higher profits. The reality is they can easily perform faster than many of their competitors already. They are just charging a premium for the pleasure. Many smaller companies in growth mode eventually hit a wall where they simply can’t grow anymore. The problem is their inefficient processes in the shop prevent them from being able to meet customer demand. Adding additional employees can help, but often provide minimal relief. This comes back to poor material management and often, poor production resource management. Again, improving your visibility across the entire business, planning capabilities, and resource management, you will find that you can often do far more with the resources you already have. A good ERP system, designed for the smaller company, can help you do exactly that. Manufacturing software for small businesses can provide scheduling tools that enable you and your staff to know what needs to be worked on and when. You can manage capacity on the shop floor and can see where any job is at any given moment. These tools can help you keep production flowing smoothly and keep orders going out the door on-time. The level of detail of your data reporting in and out of the system is completely up to you, allowing you to attain the level of control you desire. You’ve probably already started to make the connection here. By increasing your efficiency, potentially reducing your lead times, and making better use of your production resources, you should be able to improve your profitability as a small manufacturer. Add to that the ability to better estimate and track costs on products, and you have just set yourself up to complete with much larger competitors in your marketplace, and you’ve set yourself up to handle short, and long-term growth. 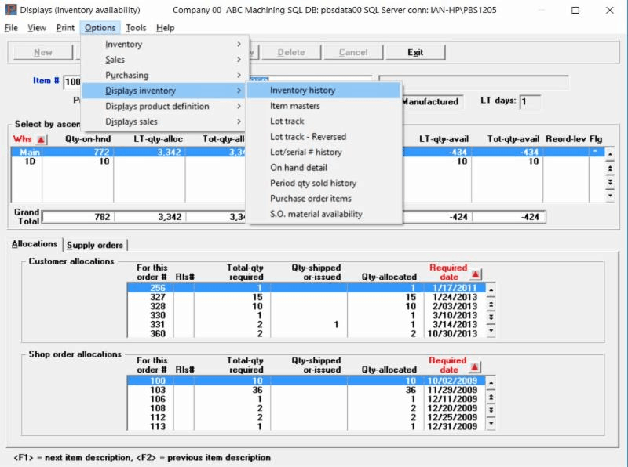 PBS Manufacturing Software for Small Businesses may be able to help you streamline operations and attain your business goals. Call 800-969-7900 ext. 145 or Contact Us – We are here to help.